Hey there everyone. Sorry I haven't posted in a day or two, but really, I've had some uneventful days, so there's nothing much to report. Yesterday, I went up to my school for the first time (it's 23 stops from where I am), and got to see the school, which is about a fifteen-twenty min. walk from the station, though Grandberry Mall is there. The school is quite small, just about three buildings, and one of them is just faculty offices. We didn't really get a tour or do anything productive whatsoever, like sign up for classes. Basically me and the other student who came from my school got introduced to the international faculty, and then sat in the library for an hour and that was it. My advisor, and old white guy from Kansas did buy me lunch (Korean Kimchi Fried Rice), but that was the extent of my day, and today all I did was clean and sleep, which was nice since I haven't had a day off yet. Word of the day: Konbini (Con-bee-nee), n. means convenience store, home of everything you need. I keep trying desperately to get a picture from my balcony that will do the view/city justice, but my little camera just can't do it, I don't think. So instead, today I'm just going to talk about a few little things I've noticed here and there. First of all, the Japanese don't drink much with meals, at most a small glass of usually green tea, and when there are napkins, they dab politely, not wipe. To show that the food is good, you slurp (soup and other things), and with noodles this is also in part to cool the noodles down as you eat them, rather than blowing on them before hand like Americans do (it really works!). Men who work in manual labor and construction often wear these baggy, almost Alladin looking pants, so they're easy to spot around lunch time. I don't know if this is universal, but as far as home-cooked meals go, they don't seem to need the food hot, so it's usually lukewarm when you eat, though when you go to a restaurant, it's always piping hot. Italian and French are the big non-Asian food places to eat, with little to no Mexican food to be found. Most carbonated drinks, if not in a bottle, are in those mini cans like Starbucks Double shots are in. They do have bats here, and wicked mosquitoes. At night, in construction zones, their orange cones are illuminated, rather than using separate signs/lights. In busy places where there are major highrise buildings, there are signs that go along the side that tell you which floor has which store, that way you know when you're coming in. Most people don't wear sunglasses, but instead carry around umbrellas to shield them from the sun (they don't like to sweat or tan/burn). My friend also tells me, though I haven't witnessed this myself, that just how we have ice cream trucks that drive around the neighborhoods in the States, they have trucks that drive around selling sweet potatoes out in the 'burbs. Pretty crazy huh? Well, anyways, that's all the stuff I can think of for now. 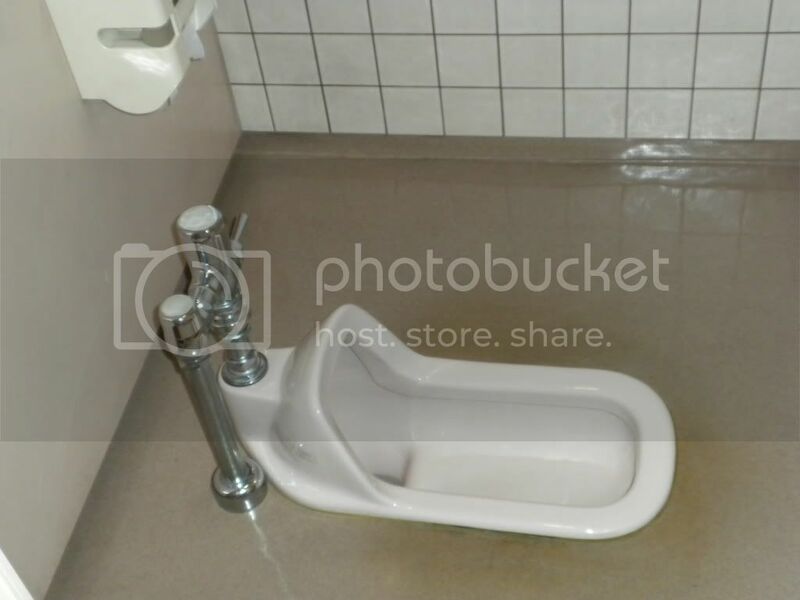 That pic, btw, is of a Japanese toilet. You squat over it. Nowadays, most places in the city have regular western toilets, but my college is a little bit older, and that's what they had. I'll have to make sure I go to the potty before I leave for school. Ttyl!